This project is focused on improving the transparency of online political advertising. Our goals are to build tools to collect and archive political advertising data. We will make publically available our data collection tools and raw data collected to enable analysis of online political advertising by anyone interested. 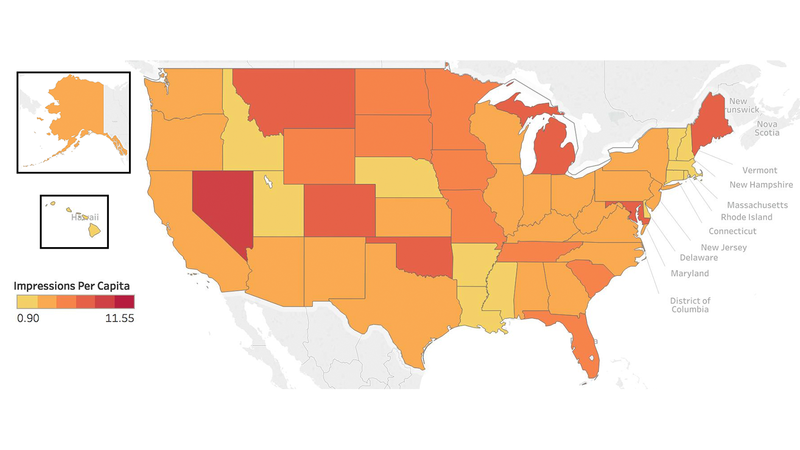 Facebook political advertising varied widely from state to state during the May-July period studied by NYU Tandon researchers. The map above shows the most ads per capita appeared in Washington, D.C., followed by Nevada, Colorado, and Maine. The fewest appeared in Delaware, Nebraska, and New Hampshire. Professor Damon McCoy and his students plan to update their data weekly from Facebook's public archive and offer it in an easy-to-understand format as part of their Online Political Ads Transparency Project.